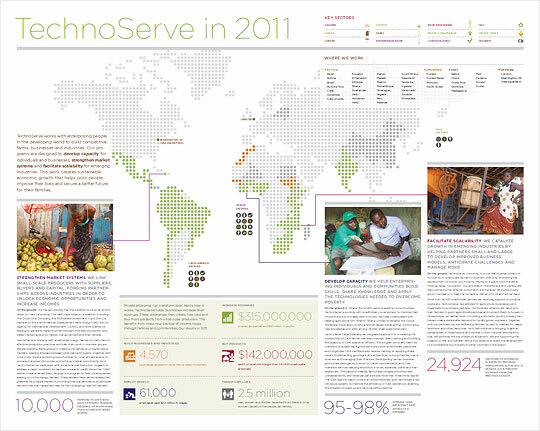 Last year, TechnoServe began the process of examining and redefining our brand. We wanted to find out how staff, partners and supporters thought about TechnoServe – our strengths, our challenges, our opportunities, the factors that distinguish us from other organizations. We knew that this work would help create a strong foundation for the future. After a great deal of research, a group of TechnoServe leaders from across the globe gathered late last year to discuss the results and chart a new course for the brand. We wanted to define our identity in a way that rang true with our founding principles, but also reflected our growth and evolution. And we were determined to get it right, because brand is more than just a logo – it’s what we do and say, as well. It’s everything associated with our organization. Today, we launch our 2011 Annual Report, where we share the first elements of our refreshed brand –the new vision and mission statements. Although the language is updated, the vision and mission reflect the spirit of TechnoServe throughout our 44 years. Our vision: We will be the most effective catalyst and partner for transformative, on the ground, market-based solutions to poverty. Our mission: We work with enterprising people in the developing world to build competitive farms, businesses and industries. These two statements capture who we are, what we do and what we aspire to be. Our vision and mission are relevant to everybody associated with TechnoServe. They help ensure that we do our work with purpose. Our annual report also goes into more detail about how we work: developing capacity for individuals and businesses, strengthening market systems and facilitating scalability for emerging industries. The updated brand is a work in progress. We are still working on a new visual identity – our logo, the look and feel of our publications, etc. – and we’ll have more to share early next year. In the meantime, enjoy the 2011 Annual Report, and learn more about our work as a catalyst and partner across the developing world. Bruce McNamer is the president and CEO of TechnoServe.